Traffic congestion is part of the California landscape. It occurs anywhere, anytime, causing costly delays and frazzled nerves. As a provider of traffic control services, RCS knows all about snarled streets. Whenever we tackle a job, one of our main objectives is traffic congestion relief. How do we keep vehicles and pedestrians flowing smoothly — without risk to travelers or work crews? Every case has a different answer, arrived at through careful planning, diligence, expertise, and experience. Nothing is easy. Fortunately, RCS is not alone in providing traffic congestion relief to Southern California. Many other entities are making their own noteworthy contributions. One of these is Caltrans. The organization’s most recent effort is a recently-completed joint project between itself, the Orange County Transportation Authority (OCTA), and the City of San Juan Capistrano. 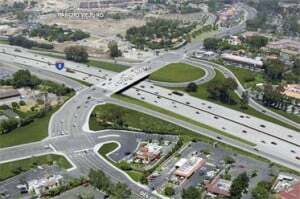 Known as the I-5/Ortega Highway Interchange Improvement project, the $77.2 million endeavor will greatly reduce congestion at this highway junction. The benefits will reach well beyond the interchange location, however. Local traffic flow, of course, is destined to be significantly smoother. But the improvements also will bring major traffic congestion relief to commuters in surrounding regions. Good for travelers. But also good for the economy — the I-5/Ortega Highway is one of SoCal’s primary transportation channels for people, goods, and services. There is one drawback, however – commuters will need new excuses for workplace tardiness. Traffic congestion no longer qualifies. The landmark project encompasses a number of design improvements. These include expanding the Ortega Highway Bridge from four to eight lanes, widening the North and South I-5 on and off ramps, and realigning Ortega Highway west of the I-5. This recent Caltrans effort to control orange county traffic congestion brings us one step closer to a goal all Californians share – smoother, safer roadways. Count on RCS to keep the momentum going with its own strategies to minimize traffic congestion in our busy metropolitan areas. If you’re interested in learning more, contact RCS for a complimentary consultation. You’ll discover why our traffic control services set the standard for safety and efficiency when it comes to traffic congestion relief throughout Los Angeles, Orange County, and all of Southern California. You can learn more about the I-5/Ortega Hwy Improvement project here.